The First Day of Spring is here! Springtime is one of the prettiest times to visit the Great Smoky Mountains. The greenery is boasting it’s color and the warmer weather is approaching. Flowers all around are starting to pop up and bloom. Animals are also returning to their active states and can be spotted all throughout the Park. Our 67th Spring Wildflower Pilgrimage will be held on April 11-15, 2017. This five-day workshop is held annually to help spread knowledge of the regions wildflowers, wildlife, history and much more. With programs held indoor and outdoor, rain or shine, there is more than enough to keep you busy! To register for this event visit the Online Registration. The Annual Smoky Mountain Trout tournament will be taking place April 1-2 this year. 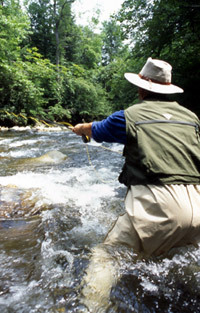 It is open to locals and tourists of all ages and is the largest trout tournament in the Smokies. Fish over 20 miles of stocked streams! There will be over $10,000 in cash and prizes! For more information or to register, visit online or stop by Smoky Mountain Angler in Gatlinburg to apply in person. Dollywood reopened on March 18, 2017 and is kicking off with the famous Festival Of Nations! This Festival will showcase several different cultures by featuring music, dance, food and art from each one. The Invaders Steel Orchestra is a world renowned band of performers carrying on traditions from over 75 years ago. They are also coming out with two new rides for the 2017 season. Drop Line is a 200-foot tall free fall ride, taking guests 20 stories high to enjoy a spectacular view of the park before the free fall. Whistle Punk Chaser is a new junior coaster that will be opening Summer 2017. This blog is sponsored by ERA In The Smokies Realty and Rentalslocated at 207 Parkway in Gatlinburg. For more info. on a Gatlinburg Cabin for your Smoky Mountain Vacation or all the reasons to move to the Smokies, call 1-800-309-0277. ERA In The Smokies is a leader in chalet and Log Cabin Rentals and Real Estate Sales in the Gatlinburg, Pigeon Forge, and Smoky Mountain areas.